Forensic Accounting Certification Course will introduce you to the world of fraud and give a deeper insight to the traits of fraudsters and investigators. Learn how cheating and deception happens and methods and strategies to investigate financial crimes using CAATTs, Forensics Tools and Novel Methods. This course is for those Chartered Accountants, professionals and graduates (with work experience between 4 and 5 years) seeking an insight into the world of forensics & fraud investigation and would like to add value to their careers. It is for those who wish to do something different from the run of the mill practice or move up the corporate ladder. There is no need to have detailed knowledge about accounting and auditing; only an open mind is required. Gain insights on how frauds happen and how to spot red flags at early stage, Protect your organization by developing forensic eye and save huge sums, Enhance your skill sets by identifying risks in your routine work, monitor your subordinates better and Learn about Audit/IT/ Forensic tools and its application. This is a Certification course by CDIMS which will equip professionals to conduct a full-fledged forensic audit. 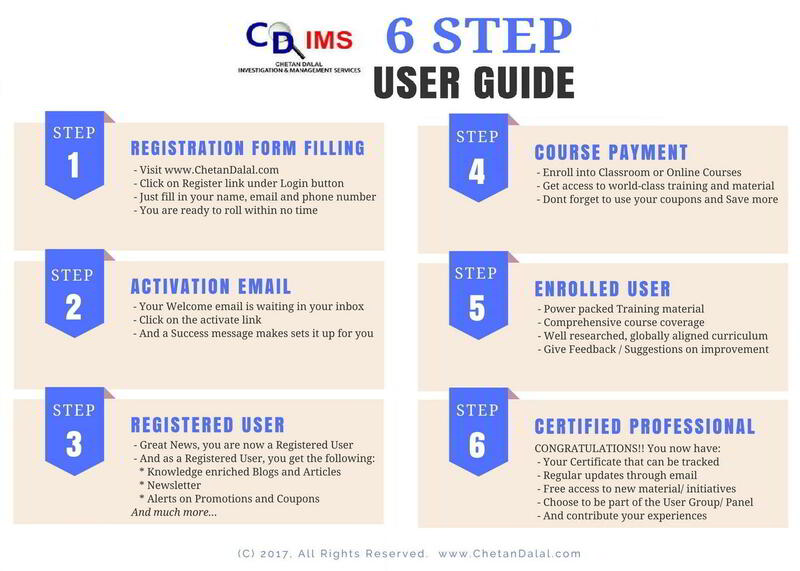 Successful completion of this course will allow participants to share with others that they have been certified by CDIMS on their visiting cards, websites etc. The fees for this course is 15,000 + GST. 1.1 Introduction to World Of Frauds and Forensic Accounting - Difference between audit and forensic audit and traits to be developed by investigators. 1.2 Early Warning Bells - Red & Green Flags, Different types of symptoms and how to spot them at early stages. 1.3 Types of Frauds - Learn about various types of frauds with case studies. 1.4 Frauds and Use of Technology - Technology is double edge sword. Learn about Steganography and spreadsheet forensics. 1.5 Structured Investigation and Reporting - Steps in conducting of investigations and contents of forensic report. 1.6 Forensic Tests -1 Test of Impossibilities and Test of Reasonableness to identify frauds. 1.7 Forensic Tests -2 Juxtaposition Test to identify frauds. 2.6 Novel and Unconventional Method (Qualitative Methods) – 1 - Use of Birbal tricks to trap wrong doers. 2.7 Novel and Unconventional Method (Qualitative Methods) – 2 - Application of Barium test principles to locate risks and frauds.